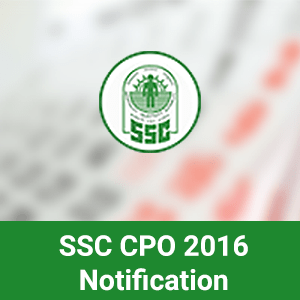 SSC CPO Notification 2016 is finally out! The Staff Selection Commission (SSC) released the official notification for SSC CPO 2016 Exam yesterday. SSC will be conducting and recruiting candidates who crack SSC CPO Exam. To get complete information about SSC CPO 2016, click on the link below for reading SSC CPO Notification 2016. There are a number of SSC Exams conducted every year. SSC CPO is conducted for recruiting specific candidates for a number of posts. The recruitment process has been simplified. For information regarding SSC CPO Exam Pattern 2016, refer to the section below. After reading the contents of SSC CPO Notification 2016, it can be deduced that SSC CPO 2016 Exam will be conducted offline. In order to crack SSC CPO Exam, you need clear both Tier 1 and Tier 2 Papers. Both Exams will be of objective pattern and will be conducted on the following dates. The Selection will be based on performance in written exam. For recruitment of SI and ASI in Delhi Police, No Interviews will be conducted. Hence, it is extremely important that you begin your preparation for SSC CPO 2016 Exam right away! We will post new articles on preparation tips, recommended books and important pointers for cracking SSC Exams in the days to come. Stay connected with OT Blog. and if there are any doubts, feel free to mention those in the comments section below. Can a B.TECh graduate apply for this post??? Yes, you can apply provided you have graduated. what about the physical test . will there be any kind of running test ? The Physical Test will be conducted in the following manner. Can a myopic patient with -5 power…apply? Questions in both papers will be of Objective Multiple Choice Type. Questions will be set in Hindi and English in Parts A, B and C of Paper I. Deduction of 0.25 marks will be made for each incorrect answer marked on OMR Answer Sheet. Can apply course BCA in distance mode??? You are eligible to apply but the Degree obtained through open Universities/Distance Education Mode needs to be recognized by Distance Education Council, IGNOU. Accordingly, unless such Degrees had been recognized for the period when the candidates acquired the relevant qualification, they will not be accepted for the purpose of Educational Qualification. Yes, there is. It has been added to the article. Please read above. Is there any kind of physical fitness test for SI n ASI? Yes, there will be a PET. Sir, What about eye sight ?? If you haven’t completed your degree till 01-01-2016, then you are not eligible for SSC CPO 2016. The minimum limit begins with 162.5 cms. For more information, refer to the table in the article. and whos tha studay of books. Can a 3rd year bsc student apply it??? If your degree is completed by 01-01-2016, then you can apply. Else, you are not eligible. No, minimum eligibility is Graduation. Syllabus for General Awareness will include Questions in this component will be aimed at testing the candidate’s general awareness of the environment around him and its application to society. Questions will also be designed to test knowledge of current events and of such matters of everyday observations and experience in their scientific aspect as may be expected of any educated person. The test will also include questions relating to India and its neighbouring countries especially pertaining to History, Culture, Geography, Economic Scene, General Polity, Indian Constitution, scientific Research etc. A candidate is required to possess a complete graduation degree from a recognized University (till 01-01-2016). The age limit for the post of Sub-Inspector in Delhi Police & CAPFs and Assistant Sub Inspector in CISF is 20-25 years. If you are able to complete your degree by 01-01-2016, then you can apply. Else, you are not eligible for SSC CPO 2016. The height requirement is 162.5 cm. Can a final year student apply? Candidates who have not acquired the bachelor’s degree as on 01-01-2016 are not eligible and need not apply. Last Date for submitting your application is 5th February 2016. I HAVE DISTANT VISION ABOUT 6/18 BOTH EYE AM I ELIGIBLE THOUGH I ALREADY SUBMITTED THE FORM THE DATE OF EXAM IS 20/03/16 SHOUL I ATTEND THE EXAM OR NOT ? Is there any sectional cut off? Delhi police si k liye tier 1 main minimum kitne marks chaeye? sir i have a small inner arm tattoo on my left hand.is it okay for ssc capf or else..?